BECAUSE NOW YOU OWN ONE! True ownership of one share of BP stock framed like you want. The recipient becomes a real shareholder of the company. BP's oil spill has brought a lot of attention to this stock. Make someone an "oil baron" even if it is just one share. 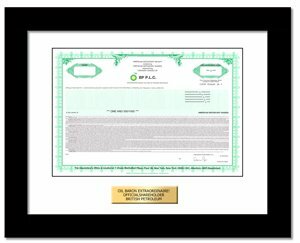 The BP stock certificate is strikingly ornate. It represents a snapshot of history incorporating the company's name, logo, corporate seal, and printed signatures of corporate officers. Get yours while you can because in the not too distant future, the industry will eliminate physical stock certificates making these valuable collectibles. BP p.l.c. engages in the exploration and production of crude oil and natural gas. BP has exploration and production interests in 25 countries in North and South America, Africa, the Middle East, and Asia, including the United States, the United Kingdom, Russia, Norway, and Canada. It operates the Trans Alaska pipeline system; the Forties pipeline system; the Central Area Transmission pipeline; and three LNG plants in Trinidad, Indonesia, and Australia. BP was founded in 1889 and is headquartered in London, United Kingdom.